The 3-day juice cleanse ended a few days ago so I thought I'd share some feedback on the experience. First, I'm so glad I did it. Honestly, I wasn't sure that I could do it without cheating. The cleanse I did was designed for those of us new to juice cleansing. It was gentle, tasty, and offered a higher caloric intake than the other cleansing options. During the 3 days I did not have caffeine withdrawal at all. Usually one day without coffee/espresso and I'm hurting. My stomach also felt lighter, not bloated like it usually feels. There were times where I was hungry, but that feeling quickly subsided with drinking a juice and water. The juices themselves were pretty tasty, but because of their look and smell, it was easier to drink them with a straw rather than having my nose all up in the bottle. this may be totally psychological. My husband says my skin looks radiant. I also felt clear minded. Oh, I did weigh myself the morning of day 3 and I lost 3 lbs. You go to the bathroom a lot. The only downsides for me were the fact that I had energy throughout the day, but felt very tired when I worked out. I made it through the workout, but I was truly exhausted. They do tell you that you should adjust your normal exercise regimen and do something light like a walk or yoga. Also, since finishing the cleanse, I haven't had a good solid sleep. during the cleanse I slept great! 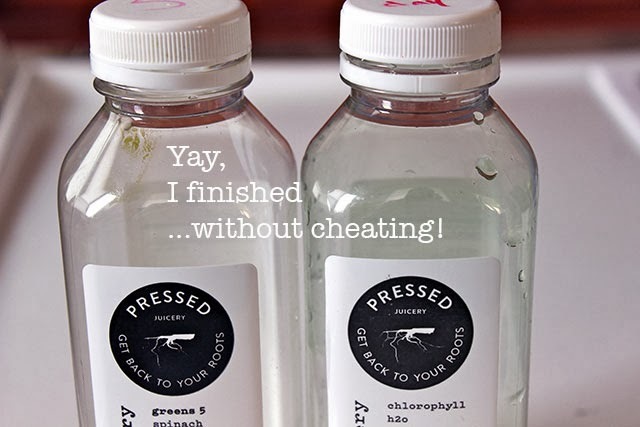 The cleanse for me was a great experience and I'd do it again the next time Pressed Juicery offers a special deal. Now I'm just working my way to a normal HEALTHIER eating lifestyle.